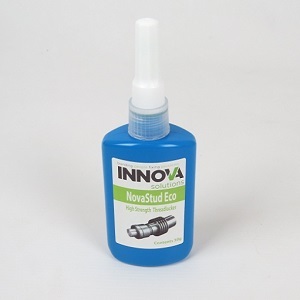 NovaStud Eco – High Strength Threadlocker is produced from our latest non-hazardous technology incorporating a bespoke group of high purity raw materials. This unique future-proof technology ensures that the product label requires no hazard symbols or risk and safety phrases, and enables the product to comply with even the most stringent health and safety requirements. NovaStud Eco – High Strength Threadlocker is designed for ultimate strength metal fastener applications such as studs into motor housings. It can eliminate the need to double-nut, or weld critical heavy duty assemblies. Due to the viscosity, it is suited to both fine and medium threaded metal parts, that will not require periodic disassembly.